I had a loud, annoying rattle going down the road that I traced to the entry door. With the rig stopped, I could hear the rattle when I banged on the lower half of the door. After a lot of failed attempts to quiet the rattle, I finally called the factory and let them listen to the sound I heard when banging on the door. They said it was almost certainly the tensioning rod inside the door. They no longer use the tensioning rod and I can see why. 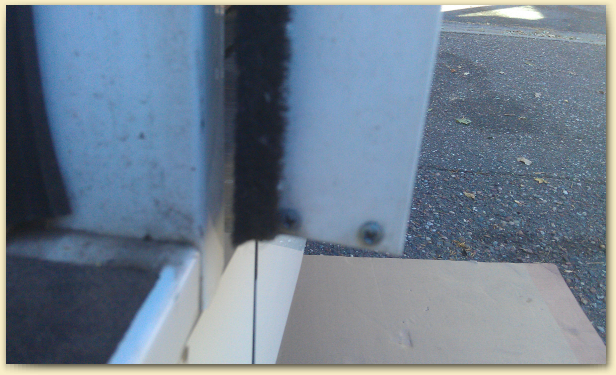 It's a threaded, vertical rod just inside the outer edge of the door. It's held in place with a nut at the bottom that not only works its way down the rod, but falls out through a hole in the bottom of the door when it finally comes loose. 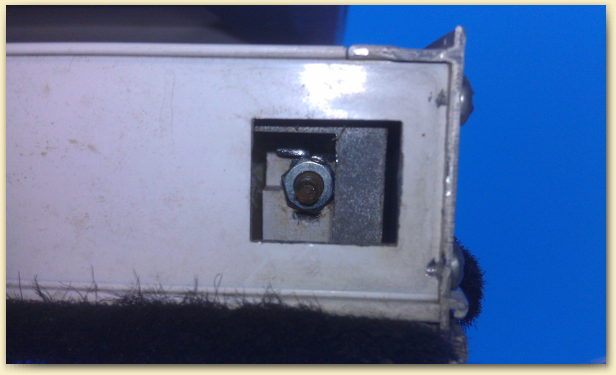 The picture above shows the rod and the nut looking up through to outer edge of the bottom of the door. If you can see it, the nut is still there, but may be loose. 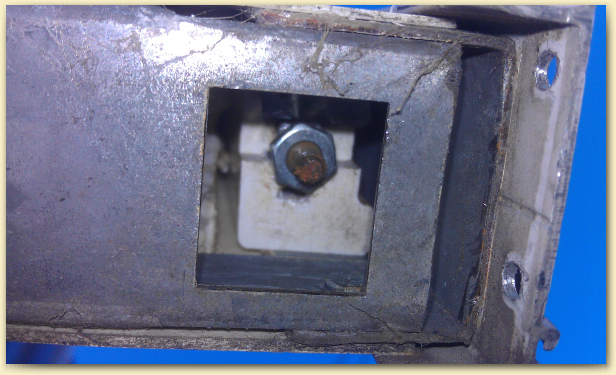 In that case, I would tighten it, and add a locking nut with a plastic insert on top of the existing nut. It's a 3/8" 10-32 nut. 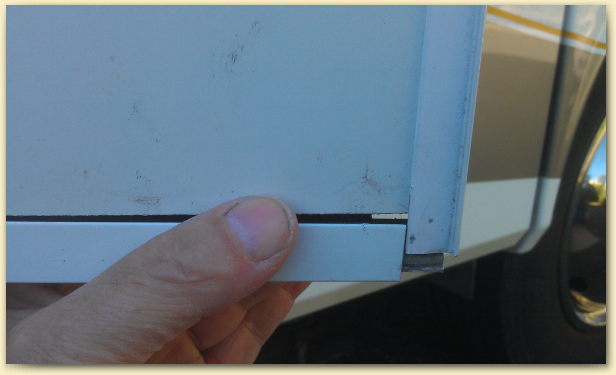 You will need to remove the bottom trim piece from the door to get full access to the nut. If you can't see the rod, the nut is probably gone. 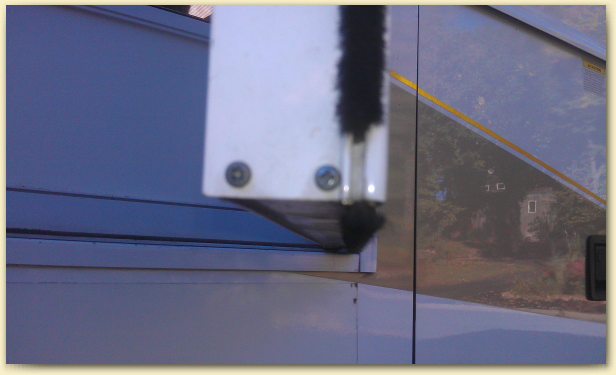 When that happens, the rod moves over against the outside edge of the door and is very hard to see. Once the trim is removed, you can shine a light on it and see it tucked over on the side. Once the four screws are removed, you can take off the trim piece by pulling down on it and rocking it from side to side. It may help to remove the two screws on the outer edge of the door between the trim piece and the latch and pull the door's outer edge trim out a bit. Be careful not to pull it out far enough to create a sharp bend. The bend won't go away. You can use a 3/8" nut driver to start the nuts, but you'll probably need a deep socket to get them as tight as you want them. A 10mm driver or deep socket will also work. If the nut is gone, the hard part is positioning the rod so that you can start the new nuts. The rod wants to be against the outer edge of the door and you need to move it in to start the nuts. You may be able to hold it in place with some tool. I tried a small, flat-blade screwdriver with no luck. I ended up making a spacer out of a piece of thin scrap metal. I bent the lower end 90 degrees so it couldn't disappear inside the door and inserted it with a pair of needle-nose pliers while holding the rod out of the way with the screwdriver. 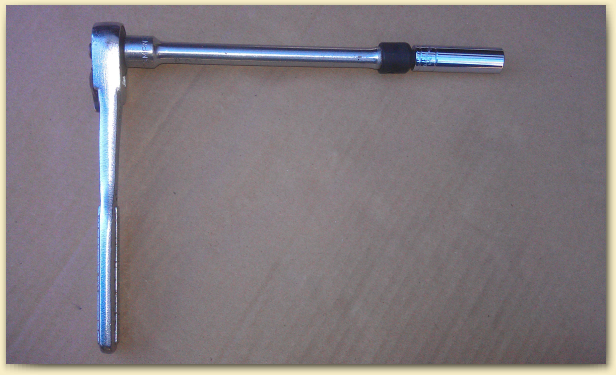 Once the rod is in the right place, it's relatively easy to start the nuts with the nut driver. I put on one regular nut, tightened it up using the deep socket, then put on the locking nut with the plastic insert to keep it from traveling and tightened that up. I don't know if the original setup had a washer or not. If I had to do it again, I'd probably put a washer above the top nut, though that would make starting the nut a little more difficult. 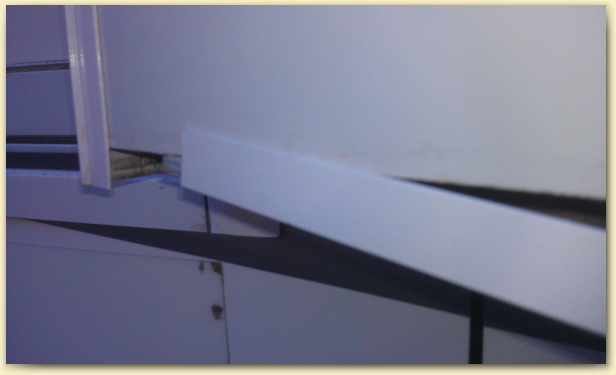 It's possible that too much tension on the rod might deform the door so that it doesn't close properly. I got the nuts nice and snug and the door worked fine, but you should probably try closing the door before you put the trim piece back on, in case you need to make an adjustment. Once you have the nuts on and tight, replace the trim piece by sliding the inner end on about an inch from the inner edge of the door and sliding it in as you work it up into place. It's possible to push the trim piece up too far so that the screw holes no longer line up, so sight through the screw holes on the inner and outer edges of the door and stop when they're lined up. Replace the four screws that hold the trim in place and then any other screws you removed (be careful not to strip them) and you're done.